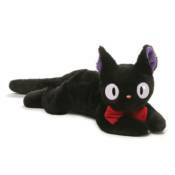 Kiki's Delivery Service Jiji 15-Inch Bean Bag Plush:The Kiki's Delivery Service Jiji 15-Inch Bean Bag Plush is based on Studio Ghinli'sKiki's Delivery Service. Kiki's trusted cat Jiji is ready to come to your home. Measures about 15-inches long x 6 1/2-inches wide x 4-inches tall.